In 1971, legendary surf movie director Bruce Brown (The Endless Summer) turned his attention to the world of motorcycle racing – and so was born On Any Sunday, widely regarded as the most important motorbike documentary ever made. Nominated for the 1972 Oscar for Best Documentary Feature, On Any Sunday features the great Steve McQueen along with Mert Lawwill, Malcolm Smith and many other stars of '60s and '70s motorsport... not to mention a roll-call of iconic bike brands, from Yamaha and Suzuki to Husqvarna and Harley Davidson. The quintessential motorcycle movie, On Any Sunday provides a fascinating insight into the riders who risk their lives racing every weekend – whether on tarmac or dirt track, ice or desert sands – making it a must for motorsport fans and Bruce Brown aficionados alike. 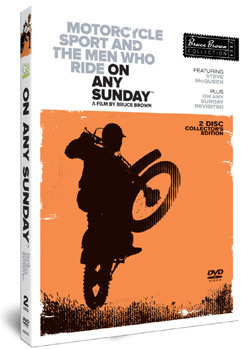 On Any Sunday will be released on UK DVD as a 2-disc Collector's Edition by Go Entertain as part of their Bruce Brown Collection on 12th September 2011 at the RRP of £24.99. The set will include On Any Sunday Revisited, an all new film created by Bruce Brown and his filmmaker son Dana thirty years on from the original movie.